Average mortgage rates today are mostly lower, as yesterday’s financial data predicted. However, conditions are rapidly changing and you should stay in contact with your lender if you’re still floating. We did get a couple of reports, and one was surprising enough that it may have some influence on mortgage interest rates. Some market watchers consider payroll processing company ADP’s monthly employment numbers to have some predictive value for the economy. If ADP’s employment numbers are higher, tomorrow’s government Employment Situation Report may also be stronger than previously expected. That would be bad for mortgage rates. While analysts had expected the addition of 180,000 jobs, the actual number was huge — 271,000. In addition, the Institute for Supply Management (ISM) released its moderately-important Manufacturing Index for December, estimated to come in at 57.9, came in at 54.1. That indicates an unexpected slowing in manufacturing, which would be good for interest rates. You can see why investors and lenders are cautious right now. Oil is higher, but stocks and the 10-year Treasury yield are favorable this morning. Still looking good for borrowers. 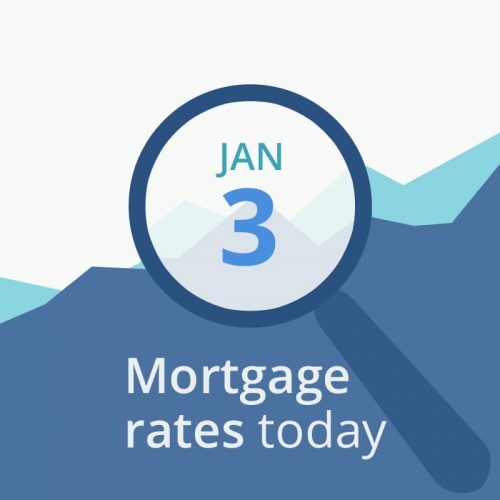 Today’s mortgage rates are very nice if you want to lock in. And you can probably float a day or so if that will get you into a better tier (for instance, drop from a 45-day lock to a 30-day, or a 30-day into a 15-day lock). If closing soon, current rates are attractive enough to feel good about. Lately, rates have defied experts’ long-term expectations of higher rates overall. HOWEVER, TOMORROW’S MONTHLY EMPLOYMENT SITUATION REPORT, IF UNEXPECTEDLY FAVORABLE FOR JOBS, COULD CHANGE EVERYTHING IN A HEARTBEAT. IF YOU HAVE A WEAK HEART, CONSIDER LOCKING TODAY. ANALYSTS CURRENTLY EXPECT THE UNEMPLOYMENT RATE TO FALL TO 3.6 PERCENT AND INCOME TO INCREASE.